Over the past few weeks I’ve been working on the next buildings for my Infinity snow board. They’re now complete! I built two L shaped buildings and another raised square building. In addition, I finally got my armoury/objective room building painted. The raised building is the same as my existing raised building, but the ramps are the other way round. The two L shaped buildings are also mirrors of each other. I gave this one a camo pattern along the lower half of the wall. Sponge on green fairly heavily. Then, just dabbing, sponge on white and last black. 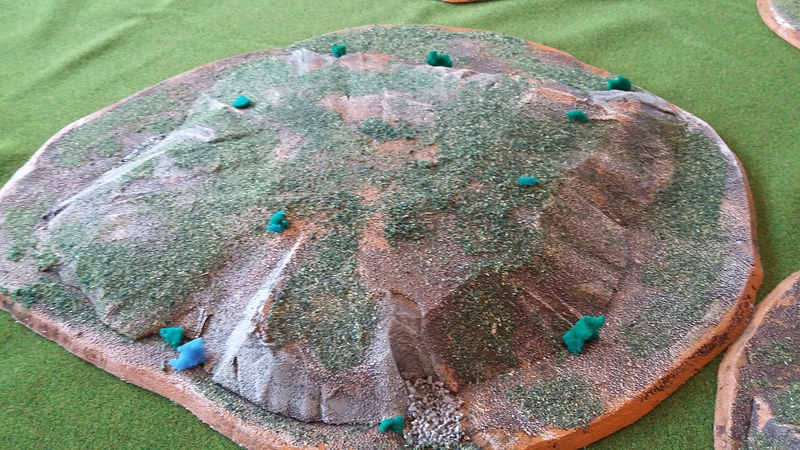 I like how they turned out and they give me more than enough to have a full table of snow themed terrain, although I still could do with themed scatter. The weekend been being a long weekend, I set up a table and had some mates around to demo Infinity. Two 150pt games that were short and brutal. For some reason I feel motivated to work on my American Civil War Union forces, despite the lack of opponent. I still need another box of infantry and artillery each, but I’ll focus on getting painted what I have first then get those. With the cricket season over I might also see about getting some games of Bolt Action too. So until then, happy wargaming! Just a quick update to showcase some terrain I’ve made for Infinity over the past couple of week and to highlight my efforts in Operation Flamestrike. I built these supply crates quite some time ago now – I think I have images in an older post. The rest of the contents arrived from The Assault Group early this year and I finally got around to finishing them off. The construction is really simple: matchsticks and cardstock. Rule out 2cm squares on cardstock and then cut them out. Make sure to also cut out a section to insert inside to form a base to put your contents on. Alternatively have another piece for a lid. Glue matchsticks around your cube and lid to form the frame. I then glue the whole thing to a 40mm renedra base. For the contents I used modern 28mm scale weapons from The Assault Group. There’s a bunch of different things there: AK-74s, Drugnovs, M9s, RPGs, SAWs and the shotguns I forget the model of. Painting them up is easy stuff: heavy coat of Raw Umber; heavy-ish dry brush Mud Puddle; very light dry brush of Bleached Titanium (a bone white). For the inside I also did some hatches of Yellow Oxide. The weapons are all painted black with Gunmetal Gry barrels and wooden details (stocks for example) done in Beige Brown. 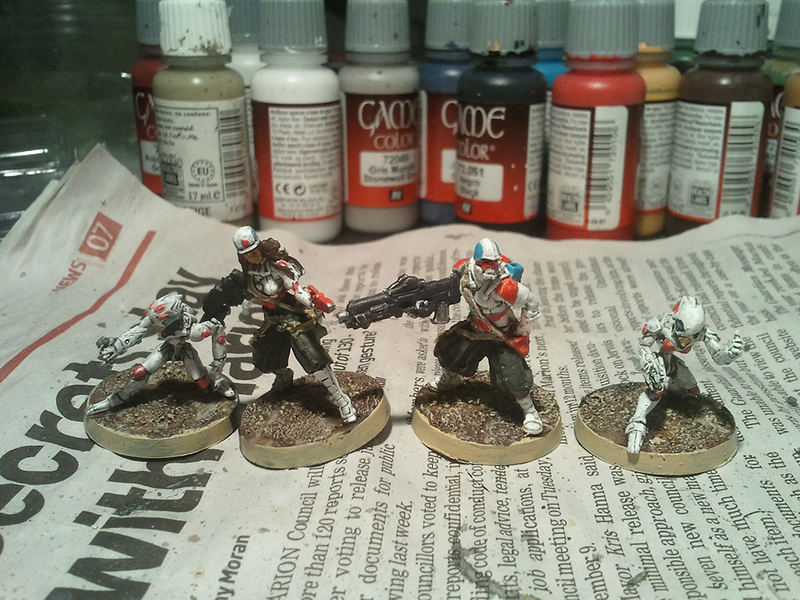 Simple pieces, look good and make for great supply crate/objective markers or just cover in general. A mate has these half cylinder bunker/barracks buildings which I think were originally for 40k. I liked them when I saw them and decided I’d make something similar. Fast forward to the other week, I finally got around to it. I wasn’t so sure how it’d all work at first, but in the end it was very easy. Draw out a half circle on foamcore (I have a diameter of 10cm). Cut it out very carefully freehand with an exacto knife and use it as a template for the other half circles. Once they’re all cut out, make sure their fairly even in shape. Draw in where your door is going and cut that out. For a base use 3mm MDF. I’ve used a piece cut to be 15cm long and 10cm wide, plus 2cm kick outs at either end in from of the door. 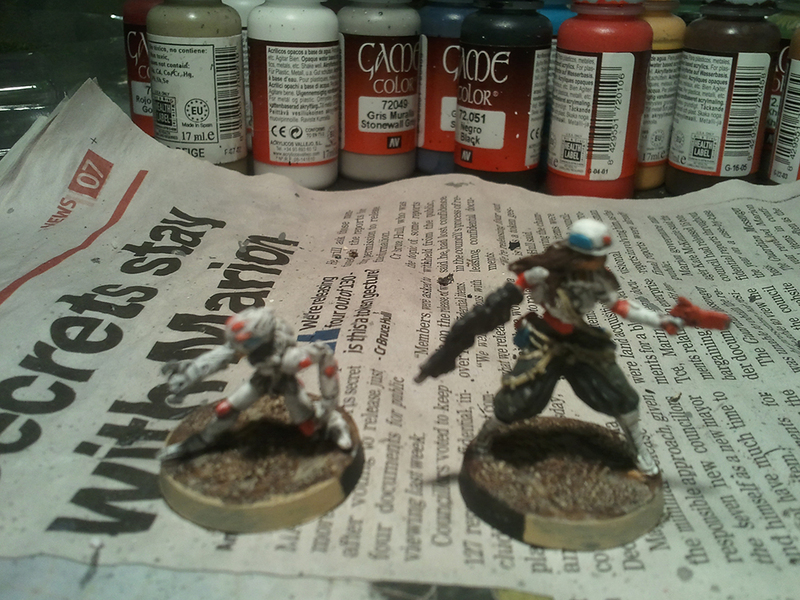 I painted the base and walls first, sponging a camo pattern on the outside wall to distinguish it from the base. Glue those on then measure out your roof from corrugated card. Roll it up to get the bend and make sure it fits right. Paint it up Gunmetal Grey and at that point it is done if you want. You can use PVA to stiffen it up (not too heavy though, you don’t want it to warp). I have a mixture of sand, grey paint and PVA for snow though, make sure it is a relatively dry mix. Once it is solid, paint it white. For the doors I used thin cardboard and cardstock with magnets glued to the outside of the walls and inside of the doors (6mm diameter, .5mm thick rare earth). Paint them up however you like and you have a removeable door. Finally I have another building for my Ariadna snow table. I used 3mm MDF for the base and the floor inside (it is raised off the base by 2cm). The base measures about 10cm by 18cm (roughly) and the building itself is about 10cm square. Standard 5mm black foamcore was used for the building itself. The ramps and roof are from a heavy-ish cardstock (Be Natural meusli bar box). I added three 2cm strips of the same cardstock to reinforce the roof. I also added a 1cm strip of cardstock around the base of the walls inside for the skirting. The exterior has a band of corrugated card round the base. Finally the doors are done the usual way: 6mm rare earth magents on the outside walls and interior of the door on cardstock tabs glued to the cardboard door proper. Colours used to paint the structure include Natural Grey, Slate Grey, White, Gunmetal Grey (all exterior), Pistachio (inside wall), Antique White (skirting and doors) and Raw Umber (floor, also sponged lightly with white). The snow on the roof is done the same way as the bunker/barracks buildings. I believe you can access these without signing up, if you are signed up, ratings, comments and commendations are appreciated. Unfortunately I can’t get as many games as I would like, but I’m playing as much as I can. This campaign means my big pile of Bolt Action painting is on ice while I get more Infinity models done plus work on my Infinity snow table. Keep an eye on my Operation Flamestrike commander proflie for more battle reports though, I may also shift them all over to here in the future too. That’s all for now, happy wargaming. 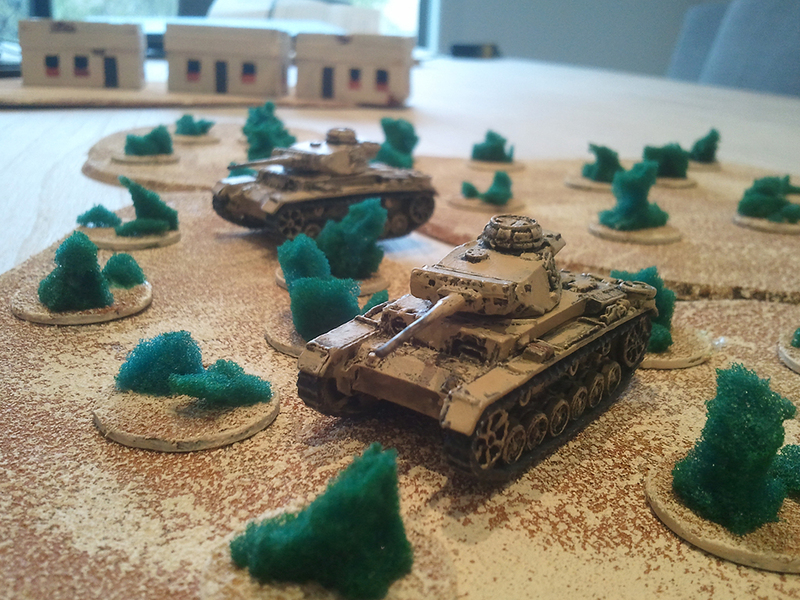 My mate and I are kicking off a three game El Alamein Flames of War mini-campaign this Wednesday. I’ve got myself into gear to do up some desert roads and an 1800mmx1200mm desert board. Simple stuff: sheet of 1800×1200 MDF (I think it is 6mm thick, I forget). Glue on sand and sealed with watered down PVA. Wasn’t the greatest idea sealing it because it warped fairly significantly. When I painted it, however, it dewarped quite a bit. I used a base of chocolate brown interior house paint and made sure the coat was pretty comprehensive. The second coat is a desert yellow colour that was mixed to match Tallarn Yellow (I think that was what it was called, an old GW paint). The second coat isn’t comprehensive and is deliberately patchy to let some brown show through. Both the first and second coat were done with a small roller. The last coat was a bone white colour (again, all the paint used is interior house paint because it’s much cheaper than craft paint) drybrushed on. End result looks great and my terrain blends in well with it – although it isn’t quite perfect because the brown I’ve used in my terrain is noticeably redder. Although the painting process saw it dewarp quite a bit, I still need to flatten it out completely. To do so it is facedown in my garage (my garage has been converted into a room so there are carpet tiles). I’ve gone over the back with a damp mop over which we’ve placed towels. Then on top of the towels are sheets of MDF (600×1200 x3 so the whole thing is covered), then an upside down table then a rather weighty amplifier. Hopefully that should flatten it out sufficiently over the next couple of days. Look forward to the El Alamein AARs in the coming weeks. 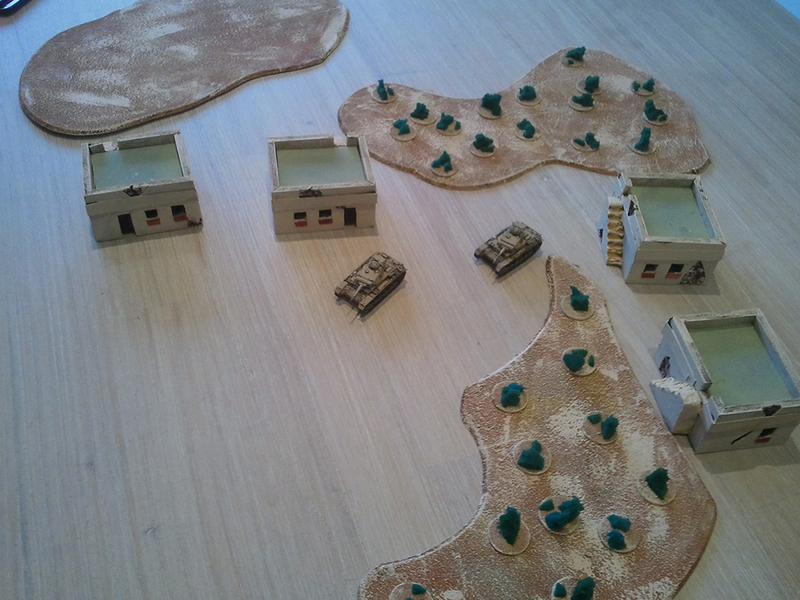 It will be my DAK (Panzer company) against an 8th army heavy armoured company. This Week: Bolt Action – Soviet Infantry, T-34, Stug, MG-42 – Oh My! 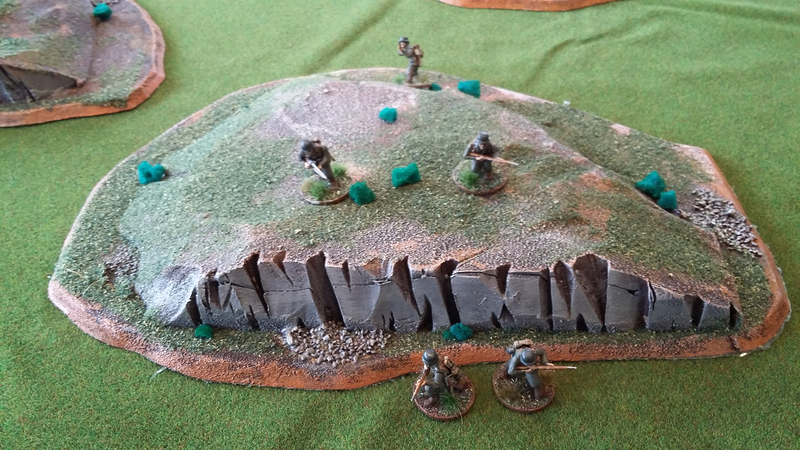 So my mate and I decided we’d see about getting our things together and actually playing on some sort of regular basis – Flames of War, SAGA, Bolt Action, basically the stuff that makes for good written after action reports. We’re locked in for a game Wednesday week (28th of October). 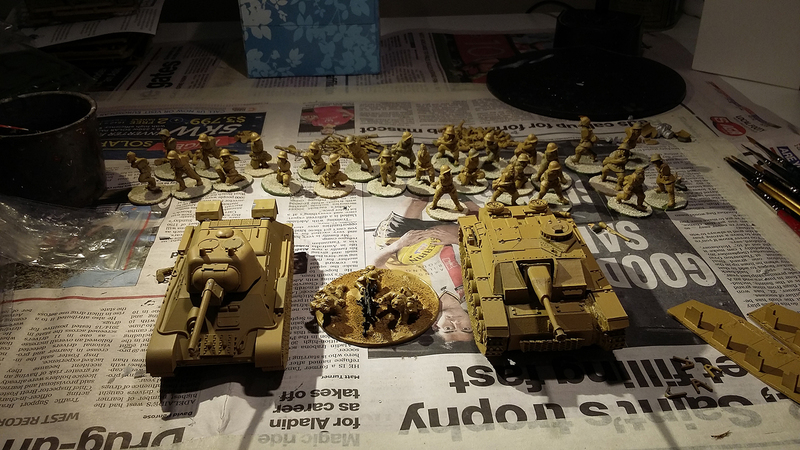 So I have 27 Soviet infantry, a T-34/76, an MG-42 team and a Stug G to get done. I would like to say here that Warlord Game’s T-34 model is fantastic. It looks great and it is really, really easy to put together. The only annoying bit is the storage on the back (I don’t actually like the way they look, I left them off all my T-34s for Flmaes of War). The Stug G on the other hand: frustrating. The reason for this was that I purchased a resin one (I believe there is a plastic model that makes a G or Stuh 42). I had an issue with the left track (so right track in the image). It wasn’t cast flat on the side that glues to the hull. In the process of trying to shave it down a bit I put the Stanley knife into the palm of my hand, which was an undesirable situation. I managed to get the track on looking ok in the end though and used some green stuff to conceal the gap that still remained. I’m not looking forward to getting the side skirts on but. I’ve not bothered with close ups yet, but I think they’re looking better than my first lot because I made the trucks thicker. I just have the messy part of cutting up the scourers for the foliage to go, so really they’re not that far away from done. 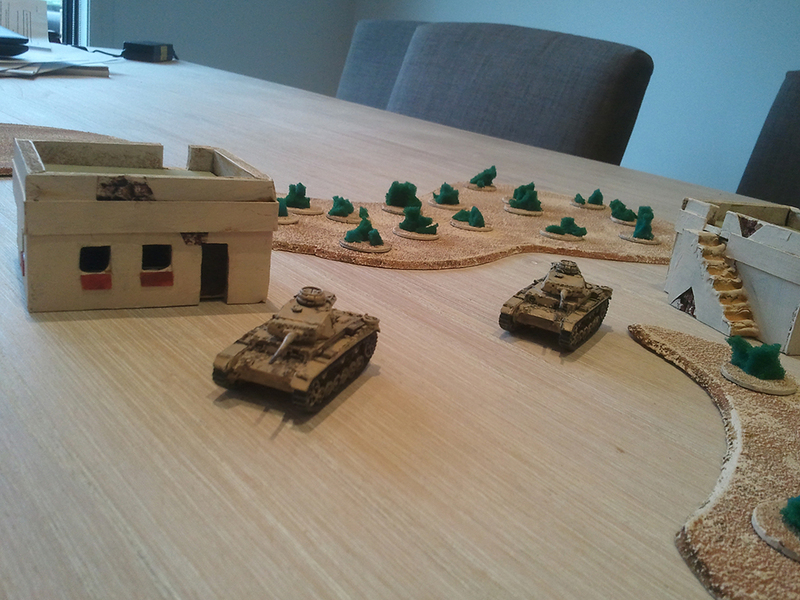 I’ve also like to get some 28mm scale rural roads done before our battle too (I bought MDF for them today). All That in a Week and a Half? Yeah, nah, probably gunna struggle with it. I’ll get as much done as possible however and we’ll see what happens. So look forward to more painted things in the future (my Anglo-Danes still need a photo shoot) and an after action report for something, probably Bolt Action. Until next time. It’s ok, I’m not dead. Just resting. Life has been pretty busy the past couple of months. Things have taken longer than I thought to complete as a result, however I’ve got a few things near completion, pictures and posting about. In my last post I also promised an After Action Report. Well I can gladly report that that battle did take place, however it was a bit of a cop out on account of it being quite a one sided affair. As a result, at the time I decided not to post about it (two months ago). I downloaded the images for it today, however, and going through them I thought they all looked pretty cool. So at some point I will post the AAR as originally intended. Today, however: hills. I finally got around to finishing my grassy hills and ridges. I made four hills and two ridges. Materials used are very simple: 5mm MDF for the bases (cut out with a jigsaw); XPS (from Bunnings, they sell it for about $12 a 1200x600x30mm – from memory – you can also get it in 50mm thick, but that costs more. I carved it up with a hot wire cutter); then the usual things, paint, PVA glue etc. Carve out the XPS (hot wire cutter makes this easy, although you can use a knife). Glue it to your MDF board. Paint that with PVA and cover with sand. Seal the sand with watered down PVA. Paint brown. Paint lighter brown. Paint rock areas a dark grey. Dry brush the rocky areas with a lighter grey. Paint with PVA and apply flock. Seal with watered down PVA. Easy stuff. 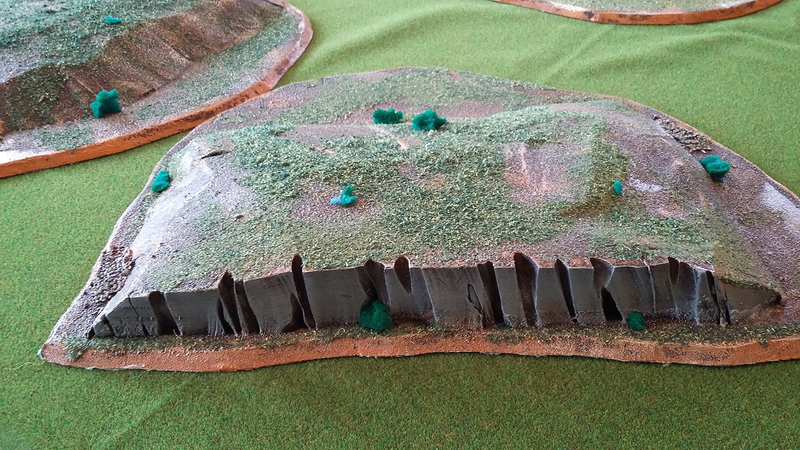 As you can see from the above images of the ridges, they are low ridges/hills at 28mm scale. They’ll hide infantry that are completely behind them, but vehicles will still be visible. 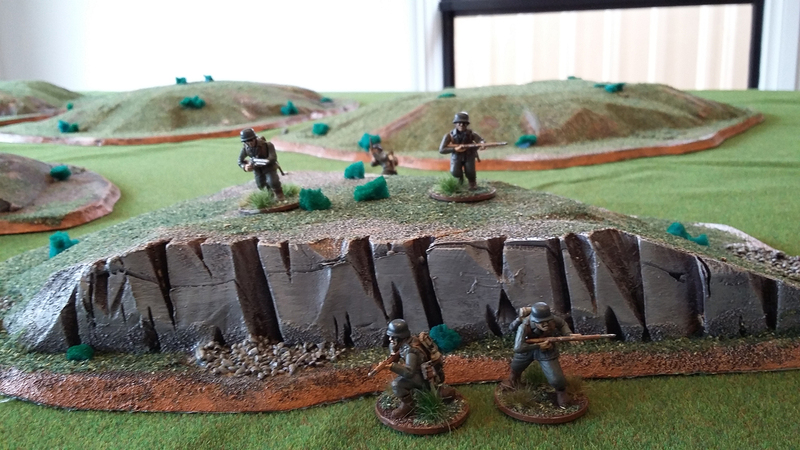 For 15mm scale, however, they will conceal vehicles and infantry. And here is a bunch of random images of them up close and a couple of other angle shots. Our loyal defenders of the Fatherland are crossing over one the hills and it all looks very nice. Having now completed these, however, I have decided I would like another few that are higher so that they conceal vehicles at 28mm too. So at some point I intend to head to Bunnings to grab a sheet of 50mm thick XPS (and more MDF, and more PVA…). From that I will make two hills and one ridge. 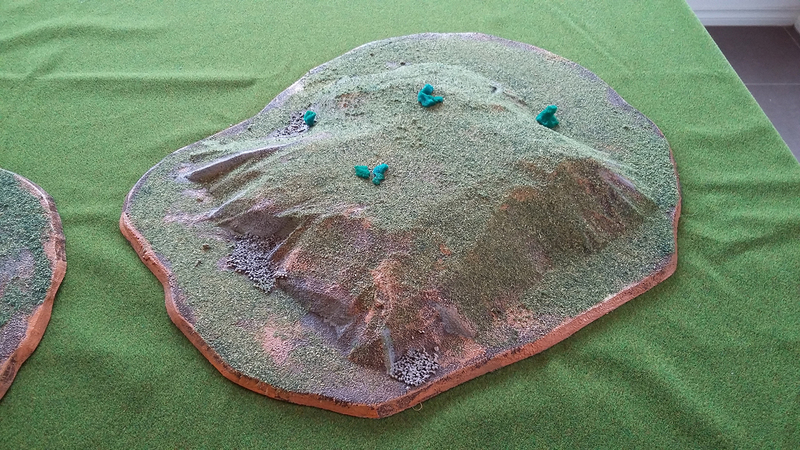 That’s all for now, just a quick post to show that I am alive and showcase the results of my hill making. 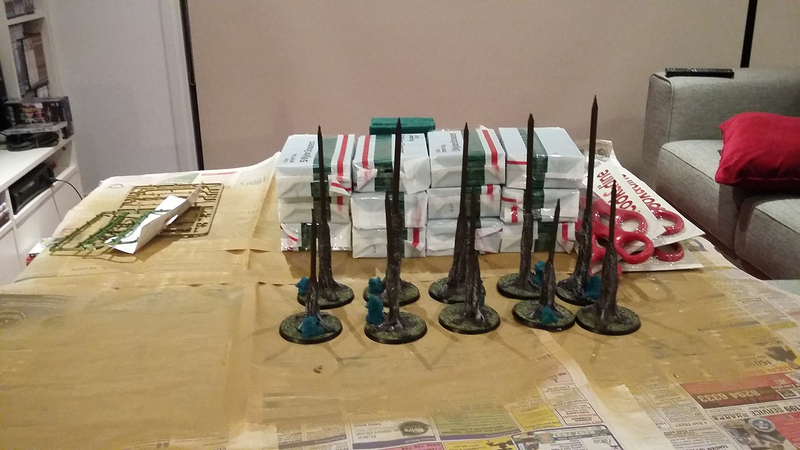 Currently I am very close to finishing my 4pt Anglo-Dane force for SAGA. They look nice. I’ve also started on my next 20 Heer/Heer Grenadier infantry for Bolt Action (the first five models of which are in the images above). 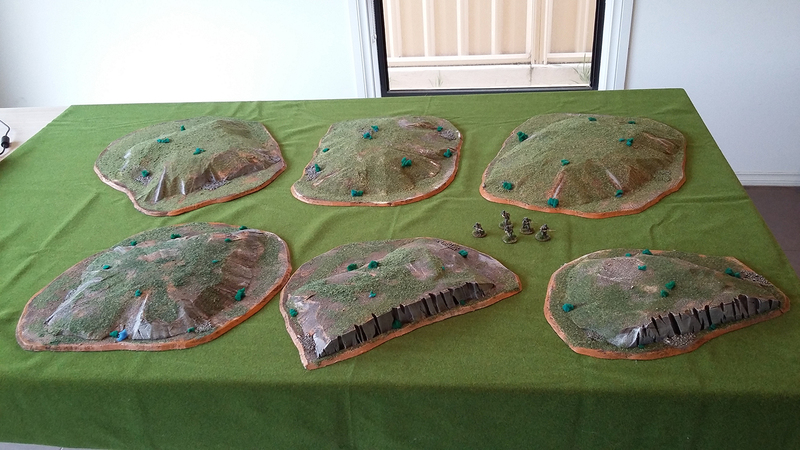 Terrainwise I am working on another 10 trees for 28mm use. They’ll be the next things to feature here, along with that AAR when I get around to it. For now, I shall try to contain all the ideas running around my head. Happy wargaming! 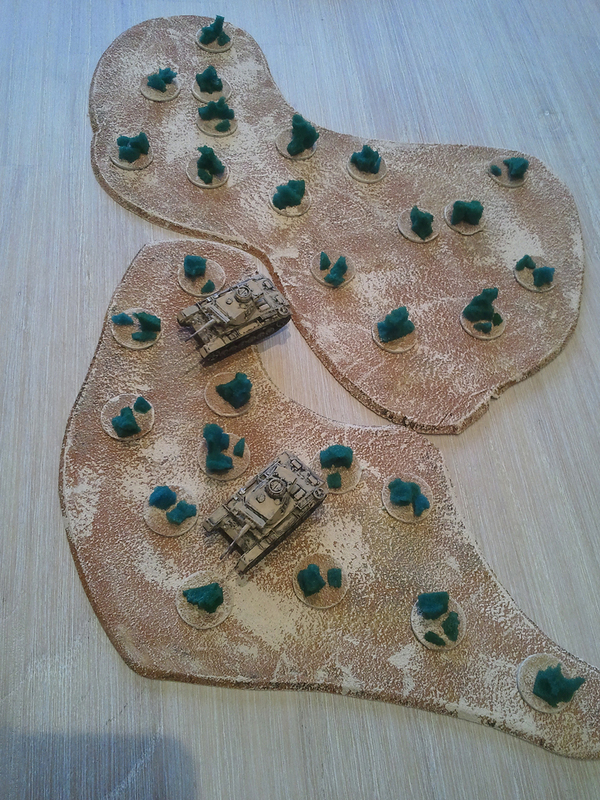 Over the past week I finally got around to finishing off some North Africa terrain for Flames of War. I also painted up a couple more Panzer IIIs that I had laying around. 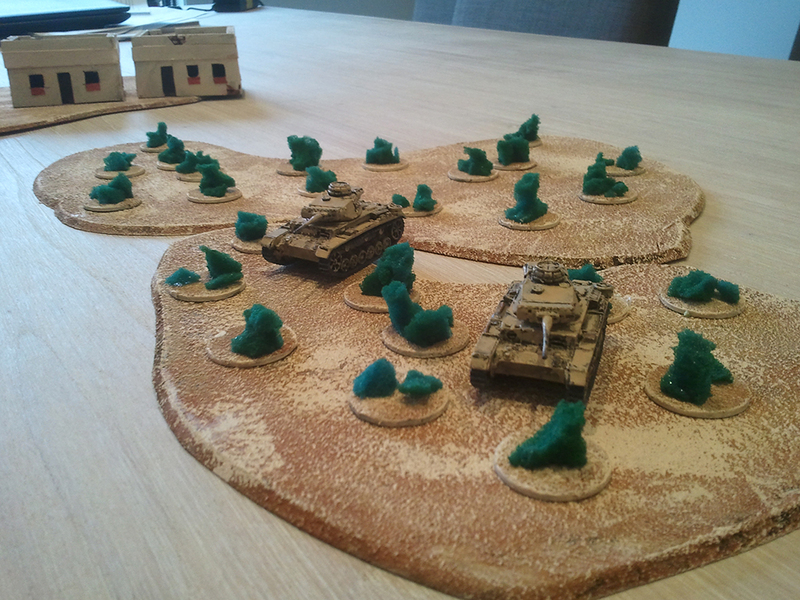 I started getting my North Africa terrain together a little after I finished painting my current forces, but I put it on the backburner and so it has been a long time coming. My plan was to have four buildings, three patches of scrub, a couple of ridges and a hill. So far I’ve finished the buildings and two scrub patches, I also have the MDF base for the third scrub patch done. 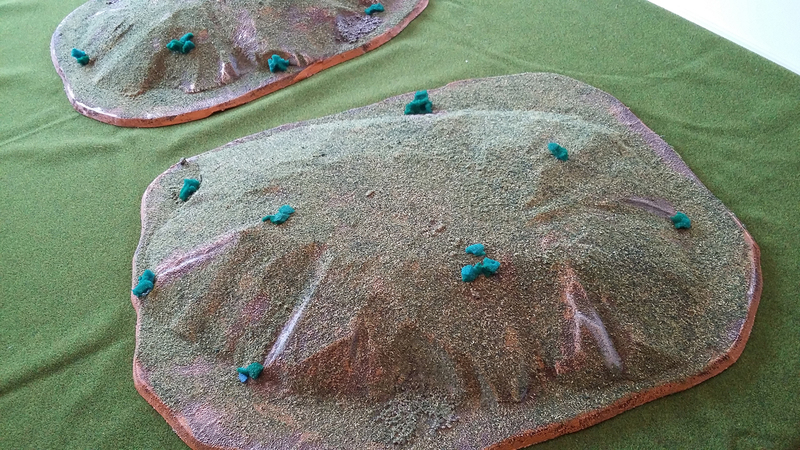 The ridges and hill are carved out, but I still have to cut the MDF bases out to glue them to. It’s been freezing cold (for here) and raining frequently so I haven’t had the chance to get outside and cut out the bases this week, but I’m hoping to get them done soon. 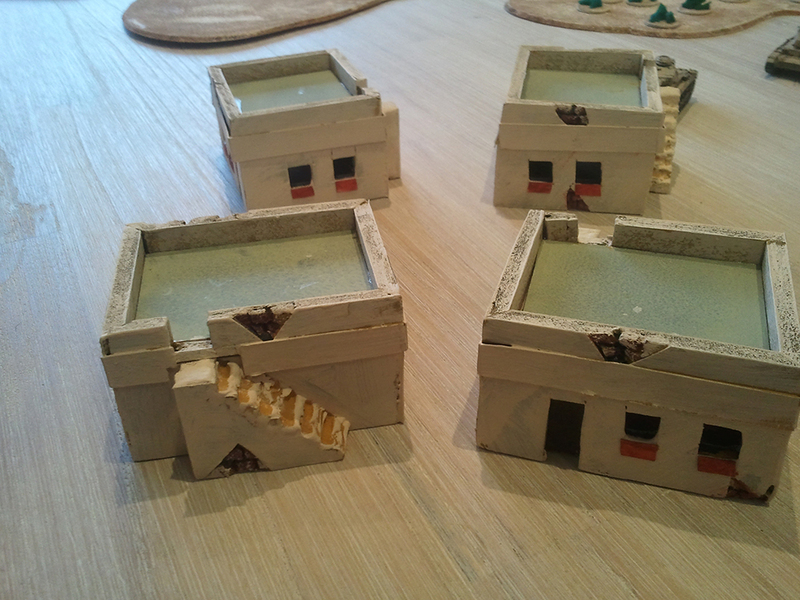 The buildings are made out of foamcore with MDF floors. I put a strip of cardstock around the bottom of the roof to conceal the cut. The rooves are removable. The stairs at the back are also foamcore, but I covered them with wood putty to make them more uniform (conceal the joins and such). The brick areas are created by taking off patches of the paper in between which the foam is sandwiched. They’re painted Unbleached Titanium with the brickwork being Terracotta. I felt they looked a little bland being completely Unbleached Titanium, so I added cardstock windowsills that I also painted Terracotta. Each building has a popstick door painted Raw Umber. The scrub is torn up bits of foam from foam pieces that have been taken out pick and pluck foam trays. I rip them up to a nice size and try to make them clumpy looking. I then dumped the whole lot in some very watered down green acrylic paint (the foam is blue) and kneaded them with my fingers. Squeezing out the excess liquid, I left them on a bit of Glad Wrap to dry. 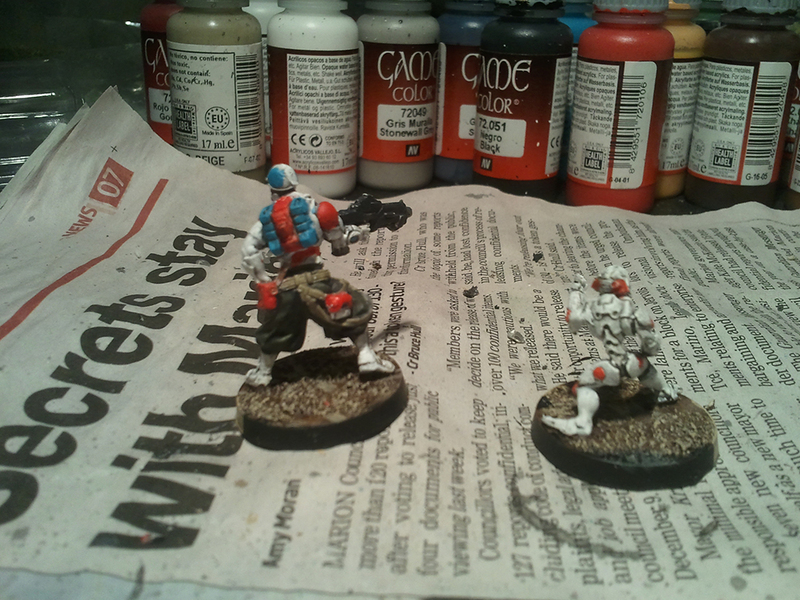 The bases are 25mm Renedra bases with sand on. The MDF is 3mm thick, though I probably would use 5mm thick MDF going forward. After sand was added, I painted them Burnt Sienna, then a moderate coat of Yellow Oxide, then a light coat of Unbleached Titanium. I think the result is nice. The scrub conceals infantry, but confers no benefit for vehicles and counts as difficult ground for them. 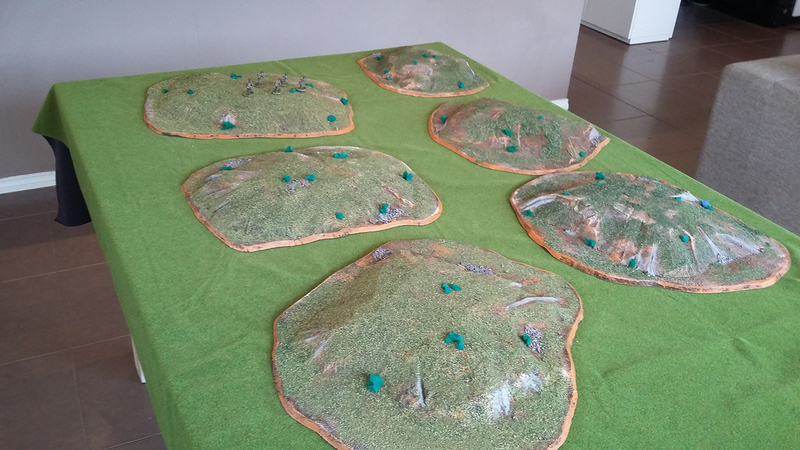 I’m pleased with the results and am looking forward to getting my ridges and hill done so I can get a small battlefield together for a game. Other things I’d like to add are some walls, a large building and an air field. I am on six weeks leave from work (I’ve not taken annual leave since Sept 2013) and have decided to complete a SAGA project in that time – and probably more besides. Last week I picked up the SAGA rulebook and two of the Gripping Beast 4pt starter armies: one Welsh, the other Anglo-Dane. I’m not sure how long they will take me to get done, but you can expect posts in the future about that project. 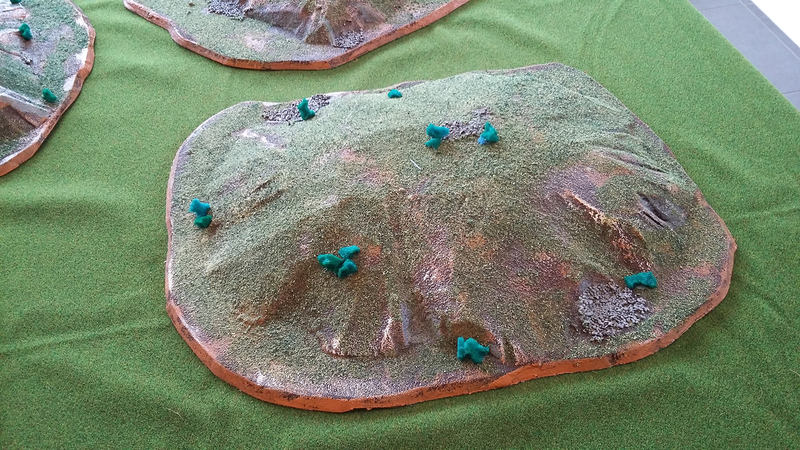 I’ve also carved out some hills and ridges (in addition to those mentioned about) and will get more trees done. So that’s what you can expect me to post about over the next month or two – though I’m sure there’ll be other things besides. It’s been a pretty good week this week. 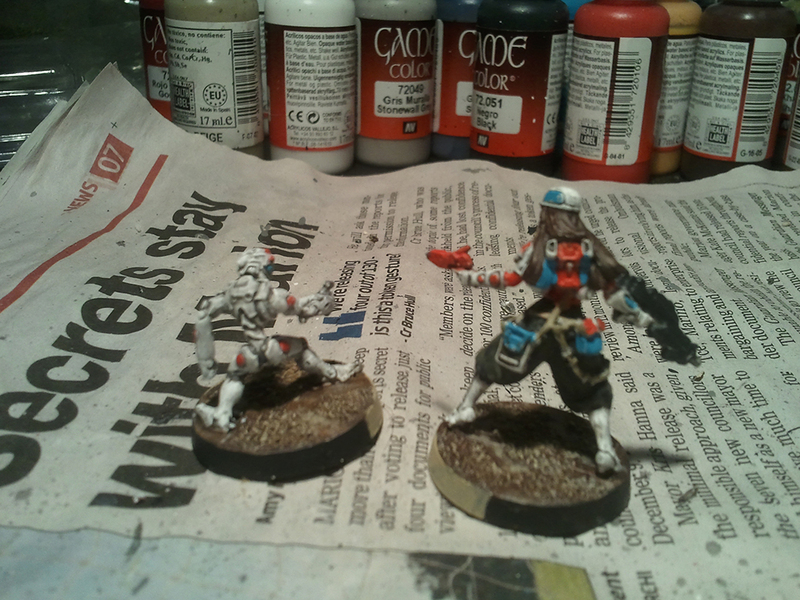 I finished off a good amount of scatter terrain for Infinity; won the two games of Infinity I played last Saturday; played a game of Flames of War on Monday; and painted my Tokusetsu Eisei and Kohei, plus their Yaozao servants. On the left we have some steel girder piles made from cut up corflute. The pieces are 6cm long (roughly) and I’ve done my best to cut evenly between the inside pieces. I glued them to a base of 3mm MDF then undercoated black. Then they were painted Gunmetal Grey and washed with a very, very watered down coat of Electric Blue. In the middle are four large cardboard boxes. Presumably with industrial sized white goods in them or something. They are just cardstock scored and folded to be 25mm cubes (roughly, I think they’re a little smaller than this, you should get a 3mm headshot over them). 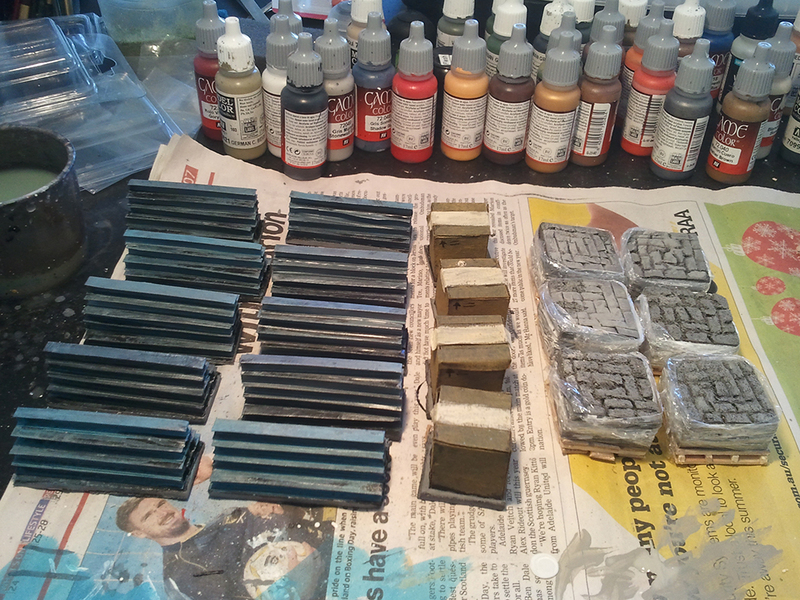 They’re painted Mud Puddle and then dry brushed with Yellow Oxide to lighten up. The masking tape over the top is painted Bone White. Finally on the right are the stone/brick piles. The pallets are popsticks cut to be roughly 33mm long. Three of them are laid out slightly spaced apart and then perpendicularly across I glued four matchsticks also cut to 33mm. Then another three 33mm popsticks are laid atop those parallel to the bottom layer. I then glued three layers of 5mm foamcore cut to size and scored the pattern in the top. 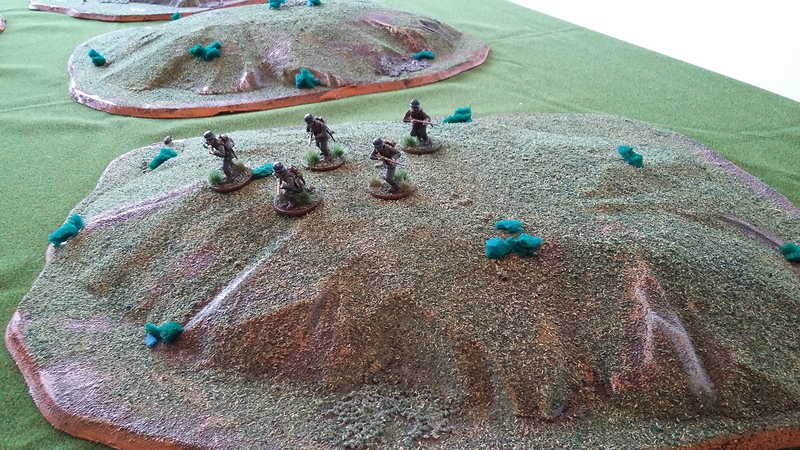 The foamcore was painted Neutral Grey. Finally I cut some Glad Wrap and wound it round the stack, gluing as I went. End result looks pretty good imo. Above we have a variety of not so great photographs of the four models in the JSA support pack. They have all turn out alright, the images aren’t particularly flattering. 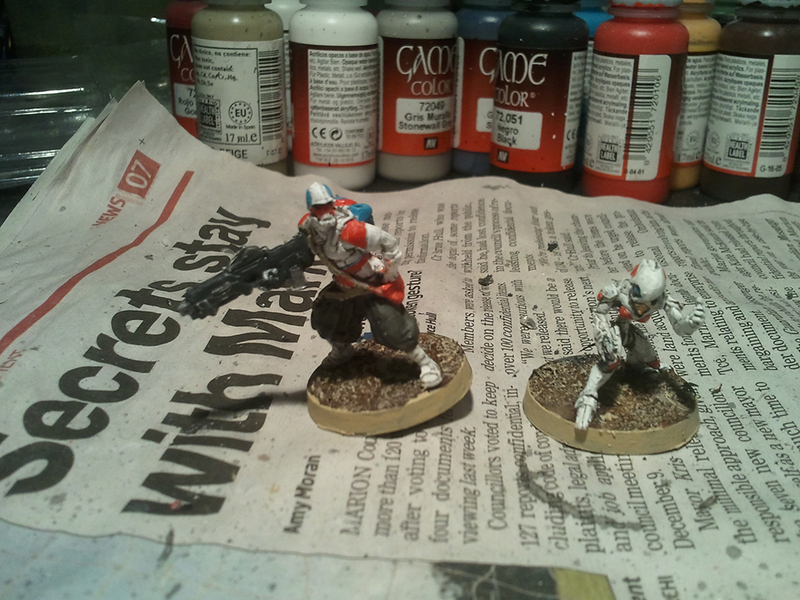 I used a lot more Bloody Red and Electric Blue on them than I usually do, simply because of the backpacks and bags etc. Pretty stock standard JSA stuff otherwise: German Grey base on the paints over which I paint German Field Grey, Dead White Armour, German Grey guns. Over the weekend I hope to tackle a blister or two and start on the Dog Warriors. I might also contemplate rebasing my painted Aragoto Senkenbutai. Maybe.